Mark your calendar now and join us for all 3 evenings! 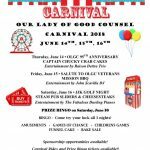 Join us for dinner under the OLGC tent! DESIGNER BAG BINGO – Saturday June 16 at 1 PM – Tickets – $25 if purchased before June 3. BINGO • Come try your luck all 3 nights! PRESALE OF AMUSEMENT 3-DAY WRISTBANDS ARE AVAILABLE FOR $50.00 PER CHILD • $2 off coupon available in the back of the church or at the Trinity Center. MegaPass 3-Day Presale $40 (Available for $50 at the event) & Nightly ride wristbands $20 (Available for $25 at the event) per person per day can be purchased online when you purchase before JUNE 13, 2018 11:59 PM. visit Innovative Ticketing. 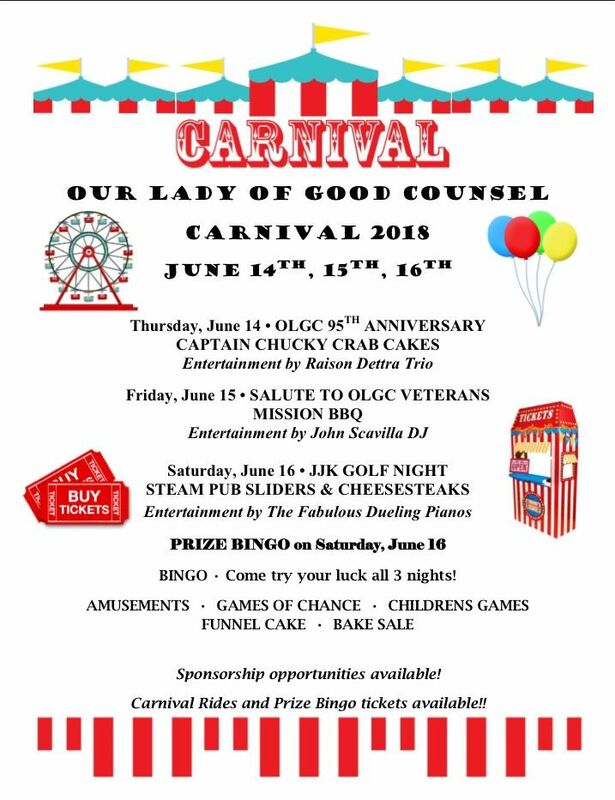 Visit olgc.org for more info or email olgccarnival@gmail.com!